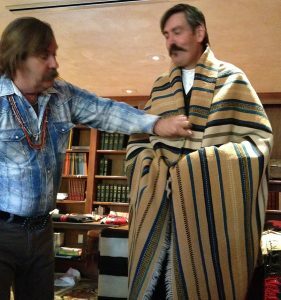 When I arrived a bit early to the “Taos Trade through Textiles” lectures, part of the 2018 NMAM Conference in Taos, NM, Mark Winter and his co-lecturer Chris Ferguson were busy arranging textiles on large tables, bringing each from a luggage cart loaded with textiles. They must have brought about fifty textiles to the conference. From the opening moment of the lecture, I raced to try to keep up my note-taking and picture-taking with all that Mark was telling us about the textiles. The first lecture was on Saltillo and Rio Grande textiles, the second on Navajo textiles. He held up a sample textile for each major point and from time to time Chris would model a textile to demonstrate how it would have been worn. To my untrained eye, these were beautiful, pristine textiles, and Mark offered them to the audience to touch. 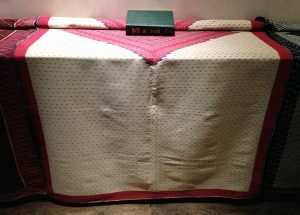 The first blanket shown at the lecture was a circa 1750 Mexican Saltillo sarape. The intricately woven Saltillo sarapes took a skilled weaver many months to weave and often used costly dyestuffs in the wool colors. They were very expensive, not much traded, and mostly worn by wealthy Mexicans. 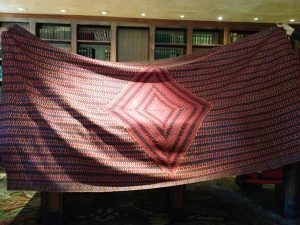 This sarape used a lot of cochineal red, a very expensive dye made from insects native to Mexico. Taos was a geographic and cultural crossroads and the site of annual trade fairs. Taos was the northern end of the Camino Real route which went as far south as Mexico City and sites of other trade fairs. When the Spanish first arrived to the new world, they introduced the small and hardy churro sheep to “New Spain”. The wool from this breed, long, silky and not greasy, took dyes very well and was perfect for weaving. It quickly became the weaving material of choice. The next group of weavings were the Rio Grande blankets. Some of the types of textiles produced included: sabanilla (loosely woven sheeting, sack cloth), jerga (loosely woven in stripes or plaids used for floor coverings and for saddle bags-the burlap of its day), colchas (embroidered sabanilla used for bed covers), sarapes and frasadas (ponchos and camp/utility blankets), indigo blankets, and the classic banded and striped blankets. We were shown examples of all of these types of textiles as Mark lectured on the history and evolution of the designs and dyestuffs. Interestingly, Merino sheep were introduced in the mid 1800’s because they were better meat producers. However, their inferior wool (for weaving purposes) eventually contaminated the churro sheep, so that by the late 1800’s the quality of wool available for weaving had markedly deteriorated. This entry was posted in Blog, Patricia's Quest by rodriguezpa. Bookmark the permalink.